Linda Christiansen receives the Kay Duffy Memorial Award at the ALSB academic conference in Portland, Oregon, in August, 2018. Representing the ALSB are Jody Blanke (l), professor at Mercer University and past ALSB president, and Dan Herron (r), professor at Miami University and ALSB executive secretary. (NEW ALBANY, Ind.)–Dr. 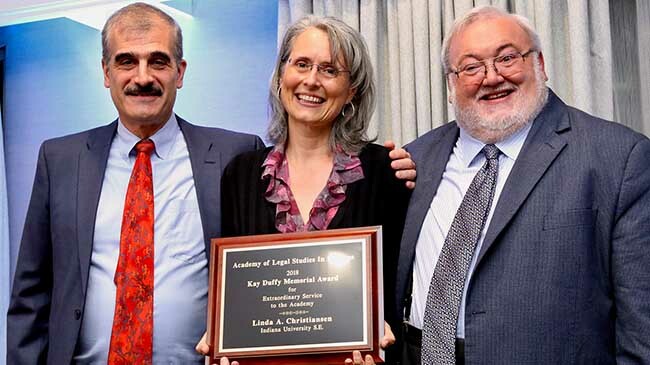 Linda Christiansen, professor of business, has received the Kay Duffy Memorial Award from the Academy of Legal Studies in Business (ALSB). The award, which is infrequently bestowed, recognizes Christiansen for going “above and beyond in service and dedication” to the organization. The ALSB is the flagship and professional organization for collegiate professors of business legal studies and ethics. Christiansen, who teaches accounting, business law and ethics, is also chief accounting officer of the ALSB and sits on its executive committee. In this capacity, she acts as the ALSB’s liaison to two other prominent business professional organizations, the American Institute of Certified Public Accountants (AICPA) and the American Accounting Association (AAA). Last year, Christiansen founded the Journal of Business Law, Ethics, & Pedagogy, sponsored by the ALSB, and served as its first editor-in-chief. The journal has been a success and is now in its second volume year. The award is named for Professor Kay Duffy, first president of the organization. “It’s humbling, because it’s such a privilege to work with and serve the ALSB, an extraordinary group of people who have been very supportive throughout my career,” Christiansen said. For Christiansen, the Kay Duffy Memorial Award is further testament to the high quality of instruction at IU Southeast. “Having professors with a national reputation and doing service for their discipline shows the excellence of the faculty at IU Southeast,” Christiansen said.